One of the easiest ways to make Christmas morning special for kids is with a fun and creative breakfast. With a bit of imagination, you can turn pancakes, fruit, toast or even oatmeal into a fun Holiday character! Most of these cute recipes are easy enough for the kids to create, too. So while you’re sipping on a cranberry mimosa cup of coffee, you can let them go crazy making Santa’s beard out of a can of whipped cream. Fruit and whipped cream make these cute little Santa pancakes easy to whip up. And who doesn’t want to eat a banana beard for breakfast? Simply top mini bagels with cream cheese, and then decorate them with sliced kiwi and pomegranate seeds. So festive! Owls love Christmas too, ya know? Create these adorable little guys with toast or pancakes! Use holiday shaped cookie cutters to create unique designs in pancakes. 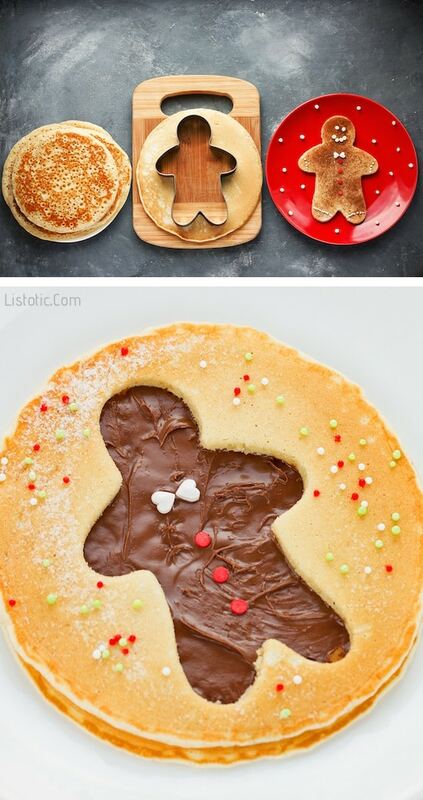 These gingerbread pancakes are especially fun filled with Nutella! You can also sprinkle them with cinnamon or cocoa powder, and then decorate with sprinkles. Because round pancakes are so easy to make (unless you’re like me and they look more like blobs), these little guys are a breeze to put together! Make the pancakes in varying sizes, and then let the kiddos do the decorating. Fun! Are you seeing a trend here? Yeah, pancakes are the easiest way to make Christmas morning fun and delicious at the same time. Simply use small holiday shaped cookie cutters to create fun shapes in bread, and then cook scrambled eggs right in the bread cut-outs on a frying pan, or cook them separately in the cookie cutter shape of your choice for a cleaner look.